We will now learn about one of the most powerful tools of mathematics; the principle of mathematical induction. Its uses are manifold in all branches of mathematics. Some basic laws of addition and multiplication can be proved using this principle. for 1, 2, . . , n. then the statement p(n) is true for all natural numbers n.
Let us prove the following statement using the principle of mathematical induction. We have to prove the truth of p(n) for (k + 1). From (i), (ii) and (iii) we can conclude that the result p(n) is true for all natural numbers. Prove that p(n): n2– 79n + 1601 is a prime. p(n): n2 – 79n + 1601 is a prime for n = 0, 1, 2 . . . , 79.
a composite number. Thus p(n) is not true in general though it is true for n = 0, 1, 2, 3, . . ., 79. ∴ p(n): 1 + 3 + 5 + . 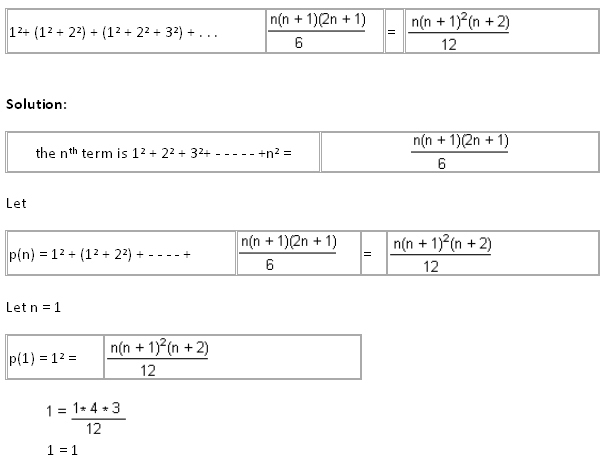 . . + (2n – 1) = n2 + 5 is not true for all n.
By this time you might have observed that the principle basically gives a method of proof for a known formula and it is not in itself a tool for inventing the formula. Assume that the statement is true for k (induction hypothesis). 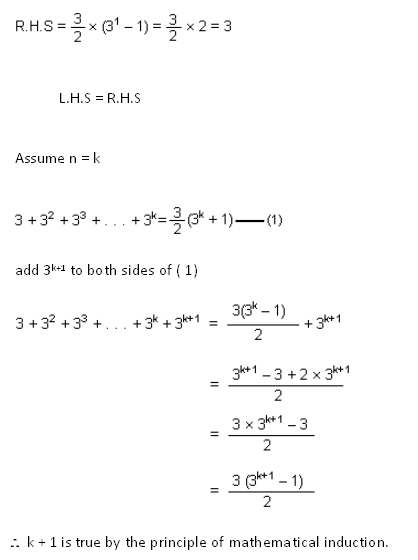 n = 1 L.H.S = 31 =3.